It may conjure images of bad musical numbers, but the "Broadway Bomb" is anything but an innocent day at the theater. So says New York Supreme Court Justice Geoffrey Wright, who granted the City of New York's request for an injunction against the 8-mile skateboarding event slated to take place Saturday. 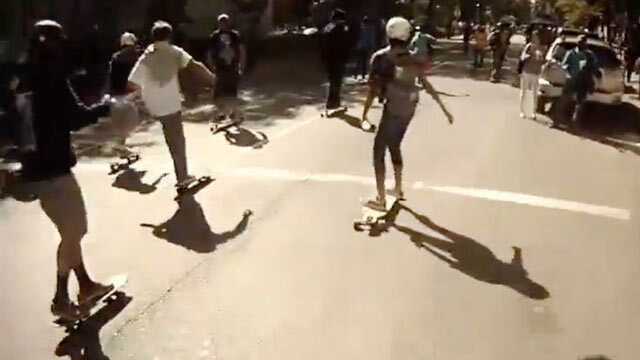 Comprised mostly of longboard-type skateboarders, the race began with 14 skaters 10 years ago and grew to 1,000 participants from across the US by 2011. The race stretches down Broadway, from 116th Street all the way to Wall Street, at the southernmost tip of Manhattan. This year's attendance was expected to double. The size of the race and the participants' behavior in years past, the city said in a statement, "such as failing to stop for red lights, cutting off and weaving through moving vehicles...and instructing vehicles which have the right of way to stop so they can pass through intersections" are what led the New York City Law Department to seek the injunction. The office said organizers have never "sought or were granted a city parade permit" in the decade since the race has been held. Though too late to secure permits for this year, Ian Nichols, co-founder of the Broadway Bomb, says the show must go on. Next year, anyway. "I plan to take steps to get permits for next year," Nichols told ABCnews.com. Nichols, 43, attributes the ballooning nationwide popularity of longboarding to his event's success. "Otherwise, if it gets any bigger, they might call in the national guard next time." Nichols said he will not participate in or attend the race and that the race has been officially canceled. However, a note on the event's Facebook page insists the tenth anniversary Broadway Bomb will still take place. "We are going to flash mob 116th Street and Broadway at 11:50AM and Start the Race at 12:00PM exactly," the note reads, "please don't show up until 11:50AM because there may be a police presence. Please share this post with everyone in order to keep us all safe. See you there." The city's Law Department told ABCNews.com they are aware of the note and said "participants will be reminded that there is a restraining order, and the event cannot proceed. Those who do not listen will be subject to police intervention, including possible arrest." Nichols denied any association with the Facebook page and said the only related work he'll being doing from now on will be toward ensuring the event, with all the proper paperwork, goes on unimpeded next year. "It has to happen," Nichols said. "This event means a lot to people who don't live in the most exciting city in the world."